(Pieter R. Cullis and Michael J. Hope). Lipid Metabolism in Procaryotes (Suzanne Jackowski, John E. Cronan, Jr. and Charles O. Rock). Fatty Acid Synthesis in Eucaryotes (Alan G. Goodridge). Fatty Acid Desaturation and Chain Elongation in Eucaryotes (Harold W. Cook). and their Bioactive Species (Fred Snyder). The Eicosanoids: Cyclooxygenase, Lipoxygenase and Epoxygenase Pathways (William L. Smith, Pierre Borgeat and Frank A. Fitzpatrick). Cholesterol: Evolution of Structure and Function (Konrad Bloch). Lipoprotein Structure and Secretion (Roger Davis). Dynamics of Lipoprotein Transport in the Circulatory System (Christopher J. Fielding and Phoebe E. Fielding). Removal of Lipoproteins from Plasma (Wolfgang J. Schneider). Lipid Assembly in Cell Membranes (Dennis R. Voelker). Assembly of Proteins into Membranes (Reinhart A.F. Reithmeier). 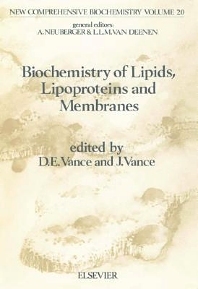 proteins into membranes, and the increasing use of molecular biological techniques for research in the areas of lipid, lipoprotein and membrane biochemistry have been included. that there is little overlap, yet extensive cross-referencing among chapters.